“polar vortex.” If you haven’t experienced either, consider yourself lucky; these words are ever bit as miserably chilling as they sound. If you ask anyone who has ever completed (or at the very least, attempted) a 365 daily photo project or a weekly project 52, they’ll likely echo the value of personal photography projects. For the past six years, I’ve focused on my own daily photo project and can attest that, from challenging myself to grow as a photographer from a technical perspective to documenting my daily activities and keeping the joy of photography strong outside of the client expectations that go hand in hand with being a professional photographer, it is a wonderfully ambitious adventure! Some of my very favorite images are those taken for daily photo prompts, many of which I would never have created had it not been for my commitment to this type of project. documenting your daily activities and seemingly small moments to produce a visual legacy. I believe in innovation over imitation so when it came time to create my image for this week, I headed over to Pixabay to hunt down some type of ice-related stock image that I could composite Hunter into and that’s where I found this frozen bubble. With its frosted look, I knew I’d be able to blend in Hunter easily without it looking unnatural…not that a 60-pound dog encapsulated in an ice bubble is natural, but who’s judging! I’ll just chalk up this craziness to that polar vortex. Have you ever tackled a personal photography project? If so, I’d love to hear about your experience in the comments! This post is a part of the Pet Photography 52 Weeks project blog circle. 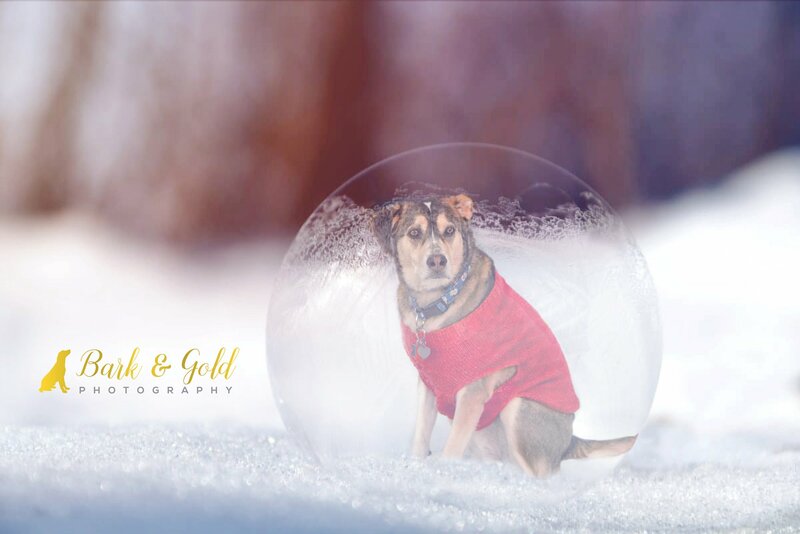 To see what the next pawesome photographer is sharing for the weekly theme, “Red,” check out Pet Love Photography, serving Greater Cincinnati, the San Francisco Bay Area, and destinations nationwide. Continue to click the link at the end of each post in the blog circle until you eventually find your way back here. ← I Already Have a Ton of Photos of My Pet; What Makes This Special? Ha! That’s really cute. Had Hunter escaped his bubble yet? Thanks, Angela! We’re still suffering through one final day of arctic temperatures, but then it’s going to rain and be about 40 degrees warmer, so…typical Pittsburgh weather! Love the bubble! Hunter looks dashing with his red vest. Thank you! They’re made by a friend of mine who owns PupCycled Pet Apparel. I love how you have incorporated so much into this image… and Hunter looks very dashing in red. I completed a 365 photo challenge last year. I loved it and feel that I learned a lot… but must admit that I was happy to be done on Dec. 31 🙂 . I am finding the 52 week challenge much more enjoyable as I am able to give more thought and time to each presentation. That’s awesome, congratulations! It definitely isn’t a project for everyone; I agree that there are always some days when I’m thinking, What the heck am I going to photograph today?! and that can surely add a bit of unnecessary stress. I think the key point is that you have to enjoy photography, whether that be daily, weekly, or less. Looks like you were a week ahead with this image! 🙂 Can’t wait to see this week’s. I think we had the same weather last week. Nicely done. I was ahead, totally not planned, however! Unfortunately I don’t think I’ll make it in for this week’s; life has been busy with Rainbow Sessions. This is so beautiful Jessica! Thank you so much, Jo! It made our chaotic winter wonderland look pleasant! Well done on a great image. 8m going to find and follow Christopher cline and see what you’re talking about🙂. Hunter looks lovely in his red sweater. I hope it warms up for you soon. Lynda, I promise you won’t be disappointed by his work! I just learned he’s also in Nicole’s HOTD Facebook group and saw some cool things he did for the Stanko edit as well. You did such a nice job with this, Jessica! I love it – nicely done! Chris’ work is fun to see! Thanks, Darlene! Composites can be tricky, but they’re always fun to play around with!